Growing up in Southeast Alaska doesn’t give a lot of edible gardening opportunities. One thing that grows surprisingly well, however, is rhubarb. Most people have trouble containing it and are constantly trying to pawn off stalks or plants on whoever will take them. Luckily, rhubarb is one of my favorite flavors. I am partial to the more tartly flavored jams and pies and rhubarb pairs well with a number of berries and other fruits. My favorite duos, however, are strawberry and raspberry. I basically live off our raspberry-rhubarb jam, and could eat strawberry-rhubarb pie for weeks without getting bored. With several bags of rhubarb in the freezer (courtesy of M’s parents in Oregon), and the need to use up my Costco supply of strawberries, a pie seemed in order. 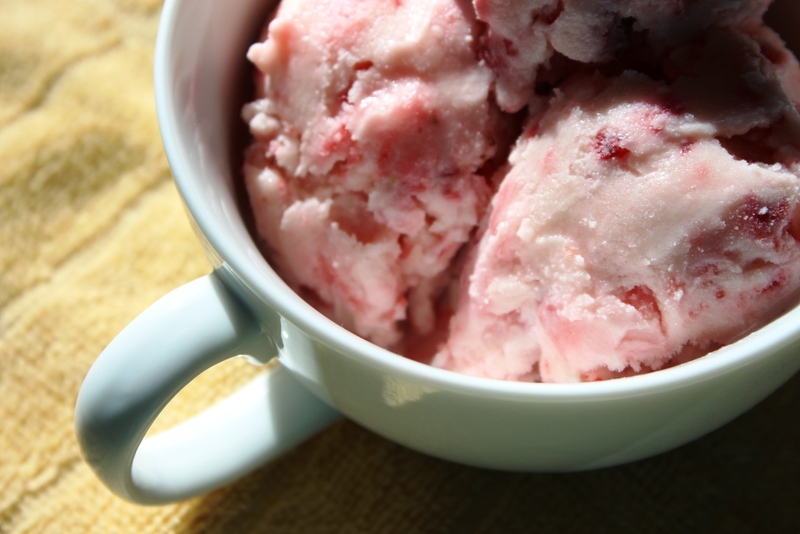 The tartness of rhubarb and the sweetness of strawberries, paired with just a hint of cinnamon, is fabulous on its own or with a side of vanilla ice cream. It keeps well in the fridge for nearly a week (it never lasts longer than that) and warms nicely in the microwave. Below find the recipe for a deep dish pie, along with my notes at the bottom. 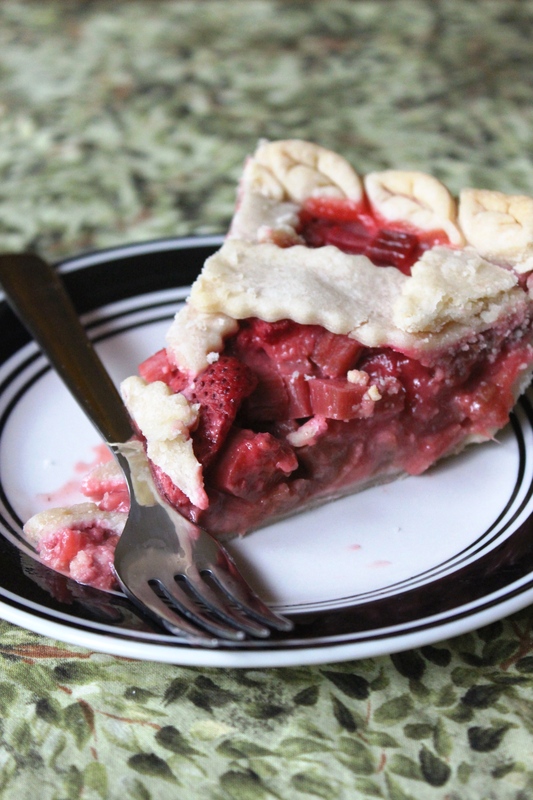 If you are using a regular-sized pie plate instead of deep dish, you may want to reduce to 4 cups rhubarb and 2-3 cups strawberries, to avoid having extra filling. Place rhubarb and strawberries in a large bowl. Gently fold sugar mixture into the fruit until well mixed, and let sit for fifteen minutes. Pour filling into unbaked pie shell, mounding towards the center. Put on top crust and bake at 400 for 10 minutes. 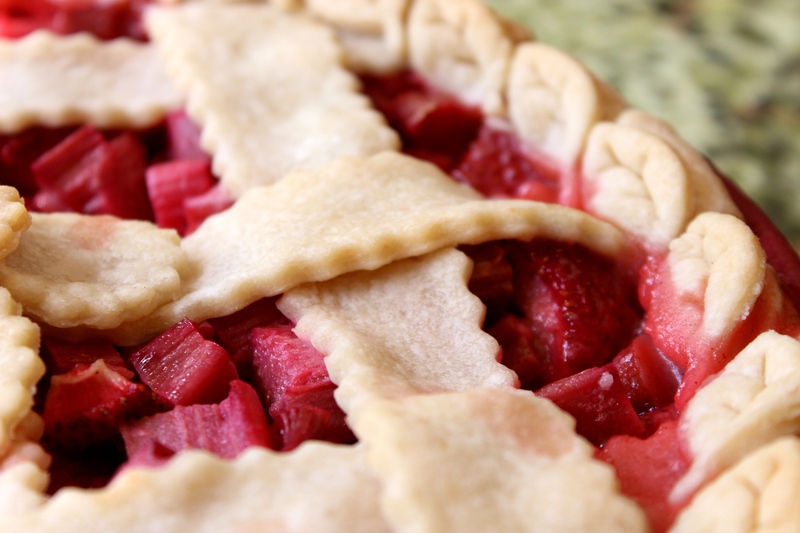 Reduce heat to 375 and bake for an additional 40-60 minutes, until juices are bubbling and rhubarb is tender. Let cool on the counter until pie plate can be safely picked up with bare hands, and then place in the fridge to store. Keeps well for a week in the fridge. 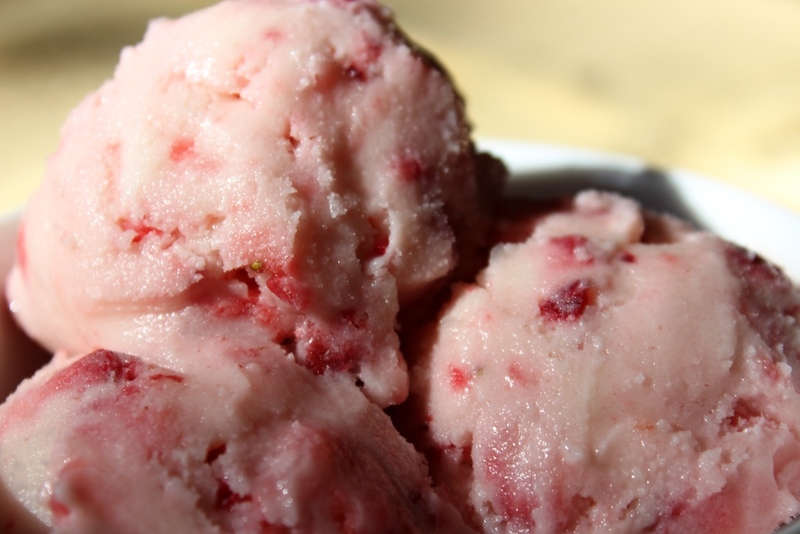 If using frozen rhubarb, allow to thaw and drain while you make the pie crust and prepare everything else. I used the full amount of sugar, but use more or less according to your preference. I like to place a cookie sheet on the shelf below the pie in order to catch overflow when baking. A deep dish pie plate will likely need the longer range of baking time, whereas a regular pie plate should be done closer to the short end. If it looks runny when you pull it out of the oven, that’s okay. It will solidify some when it cools, especially in the fridge.